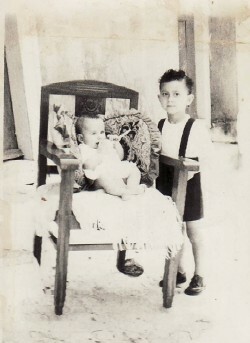 Above: As children- with my younger brother, Haralambos. 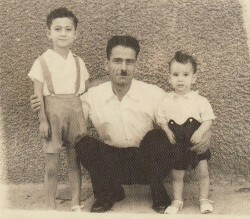 Above Right: With my father, Efstratios, and brother Haralambos. Above: Cheers! 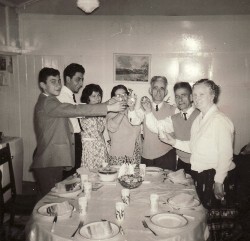 L-R: myself, Sranados and Panagiota Tiropolis, my parents, Irini and Efstratios, and my uncle Ioannis "Jack" and his wife, Flora. My brother, Haralambos, was taking the photograph. Above Right: Family and friends. 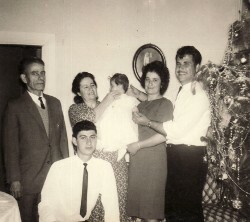 Standing left to right are: my parents, Efstratios and Irini-who is holding Meropy Lagoutaris, and Marika and Efstratios Lagoutaris. Above: Family and friends. 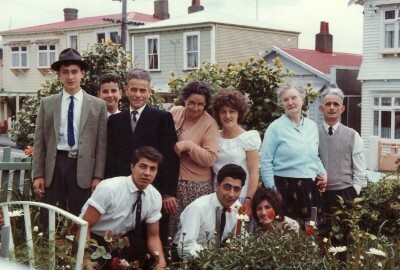 Standing from left to right: myself, my brother, Haralambos, my parents, Efstratios and Irini, Georgia, my aunt, Flora, and uncle, "Jack". In the front row are: Dimitrios Psaras and, Sarandos and Panagiota Tiropolis.